I’ve kind of had it. I had a dental crown placed on a back tooth. It didn’t feel right from the beginning. The dentist adjusted it, then it fell out. He put it back. It felt worse. He adjusted it again, but nothing got better. He told me I’m just not used to crowns and I’d become accustomed to it. I was frustrated, but what could I do? Now, a piece of it broke off at dinner. I’d had it with the dentist that placed it. Instead, I went to see an emergency dentist. All I needed him to do is reattach the broken piece, but he’s insisting the entire crown needs to be re-done. Now, I have to pay for an entirely new crown. Can’t he just fix it? I’m willing to live with the pain at this point. I just need a dentist who’s not going to do a double cross. I don’t blame you for your frustration. It doesn’t sound like your dentist has done his job. Nor does it sound like he’s shown any interest in the fact you’re in pain. I have to say, in most cases the “You’ll get used to it line…” is code for I don’t know what I’m doing or how to make it right. As for the emergency dentist, I don’t think he was trying to cheat you. It’s very likely that the crown broke in a way where a true repair is impossible. There are a couple of things which can cause pain on biting with a crown. The first is a lingering infection. I don’t know if your crown was due to large decay or a root canal treatment. If it was a root canal for an infection, it’s possible there is still an infection there causing pain. There are canals in the tooth which can be quite adept at hiding. It’s possible your dentist missed one. The second thing which can cause pain is when a crown is seated too high. I tend to lean toward this because of the fact that it broke when you bit down. Generally, our biting force, which is quite substantial, is spread out as our teeth meet together. However, if a crown is seated too high it absorbs all the force. This could lead to it breaking. 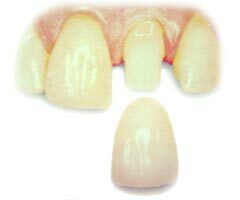 Crowns on molars are a little trickier because you have to factor in the occlusion with the other teeth. It’s very likely your dentist could do a fine crown on other teeth, but a molar is a bit beyond his skill set. The fact that his bonding didn’t hold makes me question his skill set already. But, occlusion requires the kind of extra training you would see with dentists who take an interest in treating TMJ Disorder. Option One: You could ask your original dentist to make you a new crown (free of charge). His didn’t meet even the minimum standard of longevity. I don’t know that you’ll get any better results the second time with him, but you’re certainly able to try. Option Two: You could ask for a refund and allow the emergency dentist to make a new crown for you. The refund would keep you from having to pay for two crowns and you may have better luck with this dentist. Option Three: As it didn’t sound like you were thrilled with either dentist, you could take the refund and find a completely different dentist altogether. I hate that you’re having to go through all of this trouble for a crown.